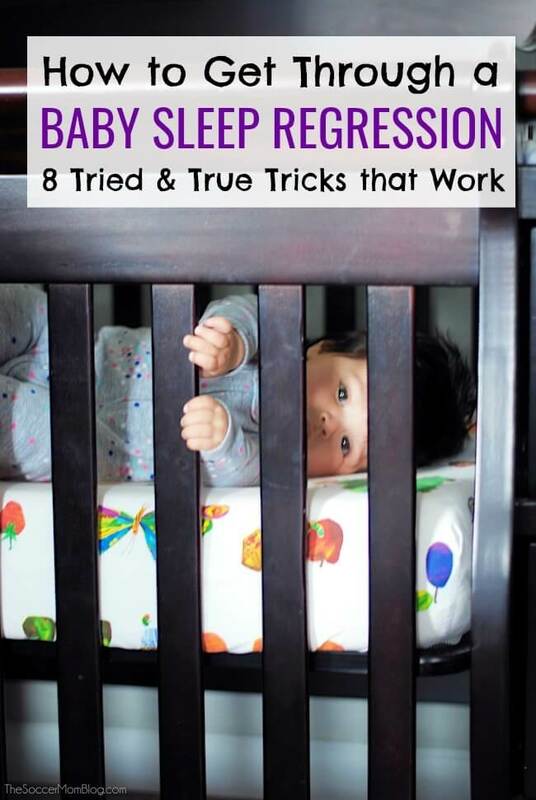 Inside: How to get through a baby sleep regression, with 8 tried and true tricks that work! (From a mom of 3). Sponsored by Panasonic. Your baby is sleeping longer and longer stretches at night. Maybe you’re down to only one night waking. All of a sudden, it seems like your baby is awake every hour! If that’s you right now, I hear you! Our youngest daughter is going on six months old, so we’ve definitely had some sleepless nights this year. Sometimes it seems like she’s sleeping so well, and then we’ll have a few days where it’s just not happening. Our middle daughter went through a few sleep regressions, so I know what to expect when the time comes with this little one. It’s not easy, and it’s not much fun, but you can and will get through it! In this post, I’ll tell you what’s worked for us to overcome a baby sleep regression for our girls. What is a baby sleep regression? Baby that used to sleep soundly or on a set routine may suddenly seem like their sleep is all over the place. It may feel as if your baby has “regressed” to the erratic sleep patterns of their newborn days. Our middle daughter taught us a LOT about what works and what doesn’t to get a baby to fall asleep and stay asleep. Because we’ve put what we learned into practice with our youngest daughter, we’ve had a much easier time establishing a good sleep routine with her. Both of our two youngest daughters slept in a crib in our bedroom until they were a year old. This made it easy for me to nurse them at night. However, during a sleep regression, it seemed like any little movement I made would wake them up. During those sleep regressions, we moved the baby into a travel crib in our extra bedroom. That way they would sleep soundly without my husband and I disturbing them when we came to bed. 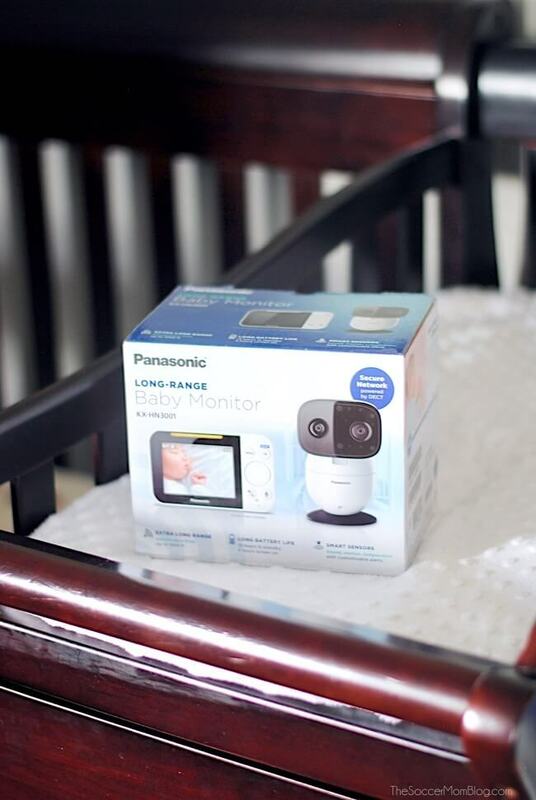 Our Panasonic video baby monitoring system allows us to keep a close eye on our little one, even when she’s in another room with the door closed. It’s motion and sound activated, so we know right away when the baby wakes up. We’ve had a few different baby monitors over the years, but this is by far the easiest one to use AND the best quality. For a quick start, all I had to do to get set up was plug in both the monitor and the camera. There was no confusing “pairing” process — when you turn on the monitor, it automatically links up with the camera. Plus, you get up to twice the range of most other monitors, so you can be anywhere in the house and still have eyes on your sleeping baby. 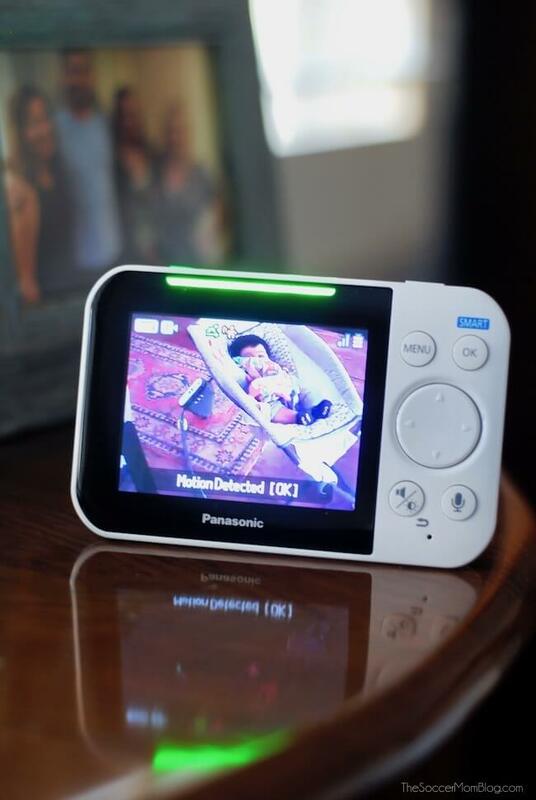 Panasonic’s video baby monitor is super user-friendly. A directional pad on the monitor allows you to pan, tilt, and zoom the monochrome night vision camera to get the perfect view. The 3.5 in Color monitor features a built-in long-life rechargeable battery — up to 13 hours of standby time and up to 5 hours of continuous baby monitor use. I’m so impressed with both the quality of the picture and all of the features! I’ll go into more detail about my favorite feature in section three. It can feel pretty isolating to be up with a restless infant in the wee hours of the morning. However, just about anyone with kids has been through sleep regressions with their babies. It’s a normal part of a baby’s early development and it doesn’t mean that you’re doing anything wrong. Knowing that you’re not alone and reminding yourself that you’re doing the best you can is an important first step in getting through a baby sleep regression. When our middle daughter was a baby, white noise helped her fall asleep — especially during the first sleep regression. I used to search for “white noise” videos (yep, that’s a thing) on the internet. Then I’d place our tablet near our daughter’s crib so the white noise would play for an hour or so and help coax her to sleep. 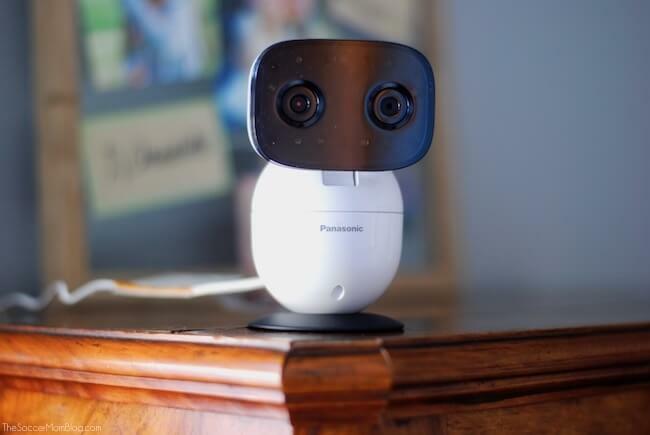 How I wish we’d had this Panasonic video baby monitor when our middle daughter was a baby! It features both lullaby and white noise features so there’s no need to buy a separate white noise machine or search for videos like I used to do. Our youngest daughter prefers music, so we use the lullaby setting the most. It helps her nap during the day when it gets a bit noisy in our house. Even when you’re smack in the middle of a sleep regression, it’s important to stay consistent with bedtimes and nap times. It can be challenging when it takes a lot longer to get your baby to fall asleep, but it’s better to keep trying at the same time every day regardless. If you’re trying to get a baby back on a sleep routine, it’s best not to get away from that routine in the first place. Stick with it, and your baby will get back into a sleep rhythm before you know it. It may seem logical to think that keeping your baby awake during the day will help them fall asleep faster at night. However, experts say the opposite is true! Keeping your baby on a regular nap schedule will help their bodies establish a circadian rhythm. That way, they’ll instinctively come to know when it’s time to be awake and time to be asleep. In the first few months of life, babies may take frequent naps throughout the day. Around 4-6 months they may transition to taking fewer naps for longer periods of time. During their first year of life, babies usually don’t stay awake for more than two-three hours straight during the day. They also give pretty clear signals when they need to nap. 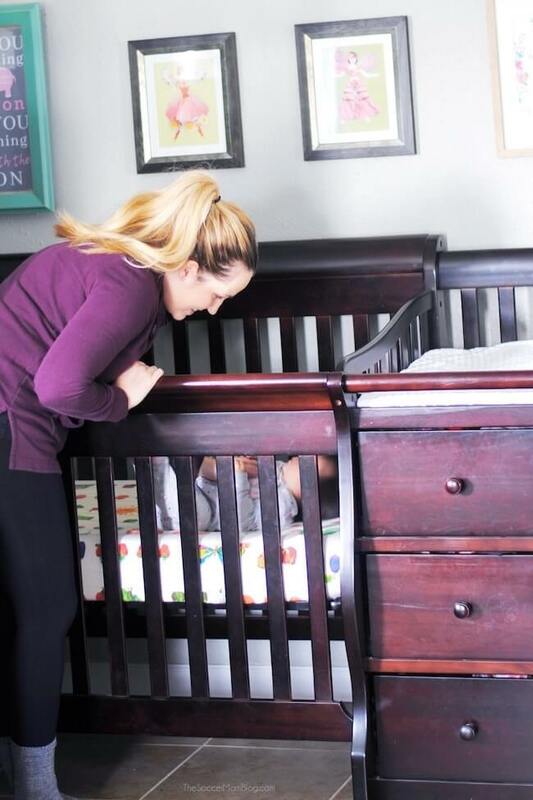 It may be helpful to have your baby nap in their crib, to establish that as a “sleep” zone. However, I go by the old saying “never wake a sleeping baby,” so if our daughter falls asleep in her stroller on a walk or in her rocker, I let her stay asleep. For peace of mind, I keep a close eye on her with our Panasonic video baby monitor if I need to step out of the room for a minute. Check out the picture quality below – it’s amazing! Sleep deprivation is no fun at all, but if you and your partner work as a team, you can help minimize it. Since I breastfeed, I have to wake up to nurse about 1-2 times per night. However, my husband helps to rock the baby back to sleep if she doesn’t fall asleep nursing. We also take turns doing the “early shift” when the kids wake up in the morning, while the other person gets a little extra shut-eye. Because we split up the nighttime duties, it helps both of us to stay sane through sleep regressions. Since changes in sleep patterns often accompany baby developmental milestones, regressions…ahem…transitions, can be viewed as a cause to celebrate! As exhausting as it can be to deal with a baby sleep regression, they don’t last forever. Generally, a sleep regression only lasts a couple weeks, so eventually, your baby will sleep better. And as crazy as it sounds, when your baby turns into a big kid one day, you might actually find that you miss those special moments you two spent snuggling at night while the rest of the world was quiet. So when you’re sleep deprived mama, hang in there! You’ll get through it, I promise. At what age do babies go through sleep regressions? 4 month sleep regression — This is the most infamous sleep regression, perhaps because it is usually the first one. Sometime between 8 weeks and 5 months, babies transition from newborn sleep patterns to a more regular sleep schedule. However, getting there sometimes involves nights of restlessness and wakefulness. 8 month sleep regression — When your baby starts hitting major milestones, such as crawling and cruising, this major brain development can create changes in their sleep. 12 month sleep regression — Around one year, babies may start moving toward taking one nap per day, instead of two to three. 18 month sleep regression — Toddler milestones, such as teething, can result in sleep disruptions. Keep in mind that sleep regressions may happen at different times for different babies, and not all babies will go through every sleep regression. The four-month sleep regression was a doozie with our middle daughter, but it wasn’t as big a deal with our youngest. However, it is possible that our youngest daughter may experience a more substantial sleep regression down the road. I suppose we’ll find out! Do you have any helpful tips to get through a baby sleep regression? Share them in the comments below! Thank God it is temporary! But oh well – I though it would never stop. I wouldn’t believe the sleep regression exist until it happed… From sleeping beauty to a little gnom! Fortunately I googled some sleep training method and after a week of hysterical nights we started a new approach. It was already getting better but I did not want IT to go back. We decided for How to teach a baby to fall sleep alone book (by Susan Urban). I had pretty good reviews on the blogs and claimed to be quick. Quick to read, quick to train. And you know what? It worked! I regret os much not doing it sooner! So it now if you still can. Will have to check it out – thanks!